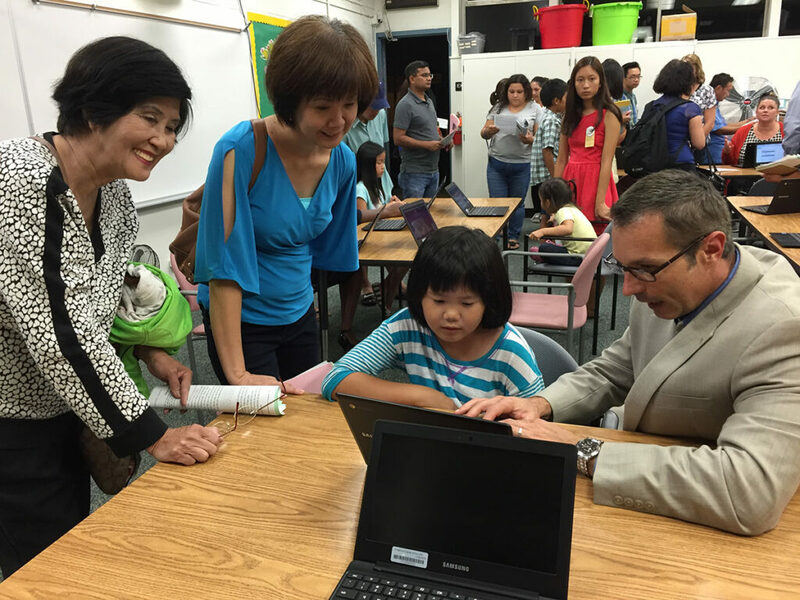 John Marsh, Garden Grove Unified’s assessment director, shows Vivian Nguyen how to take a sample Smarter Balanced Assessment test on the computer, while her mother Hang Luong and grandmother Quyen Truong watch during a parent night Oct. 7, 2015. Despite close parallels between California’s school reforms and those called for in the new federal law signed by President Barack Obama last December, California and the U.S. Department of Education appear to be on a collision course regarding the rating systems each wants to put in place to measure success or failure of the state’s schools. Led by Gov. Jerry Brown and the State Board of Education, California is moving away from a single index, score or number to rank schools and districts. In its place, California is trying to create a system to assess school performance based on “multiple measures” to give a more three-dimensional view of how schools and students are doing. However, in the draft regulations published by the U.S. Department of Education in the Federal Register on May 31 to implement the new Every Students Succeeds Act, states would be required to assign a “single rating” to each of their schools, even though the law itself does not call for it. California has been moving in exactly the opposite direction. There is now a 60-day comment period that will allow state officials and others to voice their opinions on the proposed regulations. If enacted, they raise the possibility that California could end up with two ways of ranking schools – one federal, one state. That would be a confusing outcome education leaders have been hoping to avoid. Although it is not clear how it could be done, state leaders may well try to find a way to rank a school that would meet the proposed federal requirements and would also be consistent with their current efforts to move away from the single index approach. They could also oppose the proposed regulation, and hope it will be removed from the final version. The State Board of Education declined to comment on the draft regulations, indicating that the board will look at them at their July meeting before responding publicly. The issue reflects the deeper tensions of just how much control the federal government should have over state education policies in the post-No Child Left Behind era. As a result of NCLB law, California put in place a highly prescriptive accountability system devised by Congress and President George W. Bush that conflicted in some key ways with California’s own accountability system. “I am hoping we will stick to the California way, which is not to develop a single rating,” said Carl Cohn, executive director of the California Collaborative for Educational Excellence, a new state agency intended to provide support to school districts to improve student outcomes. For most of the last 15 years, California had ranked its schools and districts with a single number using its Academic Performance Index. In theory that number could range from 200 to 1,000, but more typically would range from the high 600s to the low 900s. The target score the state set for schools was 800. But the API, based largely on test scores, has been mothballed since the 2013-14 school year, as California began introducing standardized tests aligned with the Common Core, and is unlikely to see the light of day again. Cohn recalled that in 1999 he was co-chair of the advisory committee charged with overseeing implementation of California’s Public Schools Accountability Act, which created the API. “We always thought we would not stick with a single rating and that in a couple of years we would pivot to multiple measures.” That plan was thwarted by the passage of NCLB in 2002. “I personally am of the opinion that we are finally getting it right, and this is long overdue for California,” said Cohn. Over the past year, State Board of Education members have pointed out that only 10 percent of California’s education budget comes from the federal government, and that California rather than Washington should be driving the state’s reform agenda. “How can we make sure the federal government conforms to what we want to do as well?” board member Sue Burr asked at a state board meeting earlier this year. To that end, the state board has made it clear that it plans to implement a system that in addition to test scores includes suspension and graduation rates, along with harder-to-quantify measures of school climate and student preparedness for college and the workplace. These measures reflect the eight “priority areas” set by the state as part of the Local Control Funding Formula championed by Brown. State board President Michael Kirst has used the analogy of devising an accountability system similar to gauges on a car dashboard, each measuring different components of a car’s performance. What is puzzling is that the new federal law and the draft regulations also call for states to rate school performance using multiple measures “based on academic outcomes, student progress, and school quality” – seemingly what California is introducing. In fact, the draft regulations stipulate that the single school rating be based on at least three indicators of school performance. The draft regulations even acknowledge the drawbacks of a single-rating system. “Many schools may excel on some indicators, and struggle on other indicators – information that could be hidden if only an aggregate rating were reported, or if performance levels were reported on some, but not all, of the indicators,” the draft regulations read. Thomas Dee, a professor at Stanford University’s Center for Education Policy Analysis, said that he was broadly supportive of the draft regulations, because NCLB’s test-based accountability system had resulted in improved academic outcomes in some areas. For that reason, he said, the Department of Education is “on solid ground in terms of the research.” “Summative ratings for schools that convey some idea of how a school is doing does drive school performance upwards in meaningful ways,” he said. One outcome that education officials want to avoid, in addition to the confusion that could result from using two conflicting ways to measure school improvement, is the administrative costs of setting up two such systems. During all the years that No Child Left Behind was in effect, schools could be deemed to be succeeding under federal law while failing under state law, or vice versa. Multiple Measures, as presented here from the state would provide a clearer review of school performance. As several people commented in the article, a single score conceals areas in need of improvement. The California plan deserves an opportunity to function without distractions in order to demonstrate its effectiveness.